The launch event kicked off by the surprise arrival of stars Iman Ali, Anoushay Ashraf, Faizan Haqque and the musical sensation Zoe Viccaji. 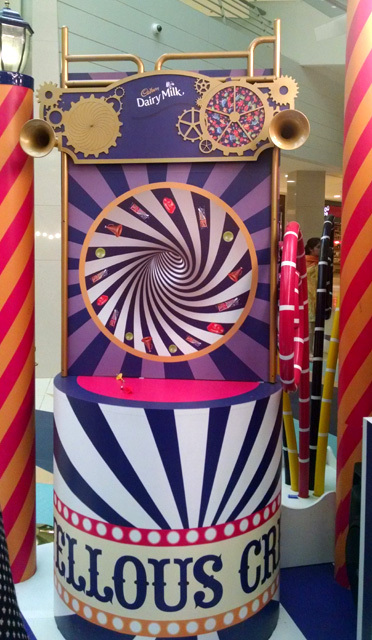 The celebrities revealed the ‘Match & Win’ game and ‘Magical Doors’ which allow shoppers to play for a gift hamper. They also kick started the lucky draw which will have daily winners as well as a grand prize of 1 Million Rupees at Dolmen Mall Clifton, powered by Summit Bank. The prizes for Dolmen Mall Tariq Road and Hyderi are 500,000 PKR and 250,000 PKR respectively, which will be announced along with the grand lucky draw winners at the closing ceremony on the 1st of January 2017, making someone’s new year really special! And not just that, shoppers can also win gifts from Dolmen Mall brands through five lucky draws every day. To participate, regular shoppers will have to show their receipt of a PKR 10,000 purchase whilst Dolmen Loyalty Card holders would be eligible to play with a purchase receipt of PKR 5,000. With each floor at the malls designed to bring with it a new set of activities to entice the audience to explore further, Dolmen Malls truly appear as a shopper’s paradise. Dolmen Mall Clifton, Tariq Road and Hyderi feature a beauty lounge that is a treat for makeup enthusiasts who have a chance to learn tips from experts and get free makeovers. Children will also get a chance to play our life-sized games and win for themselves in the Carnival while families can enjoy exhibitions of Home n Décor, Dolmen Bazaar and various other festivities. As an added treat, Sunny Day brunch will be hosted every Sunday in the food court at Dolmen Mall Clifton and Tariq Road to encourage people to try new food and reignite the ritual of having Sunday breakfast with the family to the soulful sounds of live music. Careem also started the special promo code for the Shopping Festival, just book a ride with Careem to get 20% off to/from Dolmen Shopping Festival. Use promo code ‘DSF2016’. Code is valid till Valid till 31 Dec 2016. The management at Dolmen aims to provide quality events year after year, giving their audience a chance to celebrate. As our Independence Day approaches, we see the city changing itself to represent the colors of Pakistan, and Dolmen did not stay behind in giving its visitors a flavor of patriotism. This year, their theme, ‘Dolmen loves Pakistan’, was weaved around the concept of #HamariPehchan aimed at giving people a chance to celebrate Pakistan’s identity. 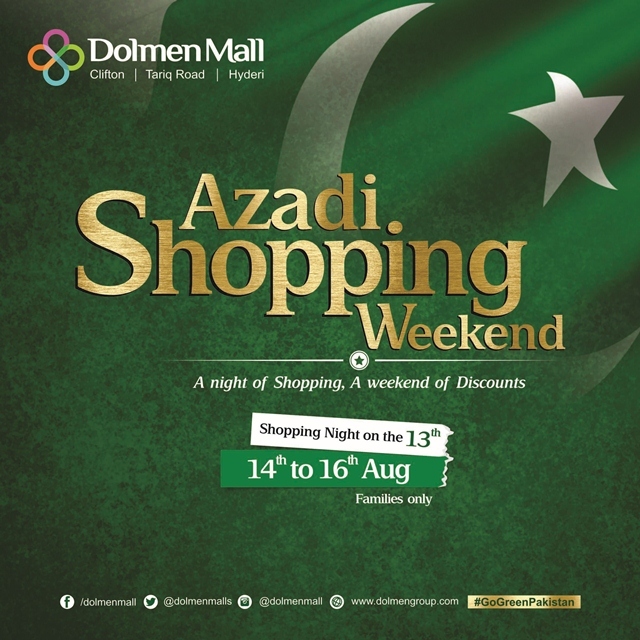 Spanning across all three malls, namely Dolmen Mall Clifton, Dolman Mall Tariq Road and Dolmen Mall Hyderi, the event kicked off on 12th of August 2016. A weekend worth of activities were executed in all its patriotic glamour and glory. For this, the mall was draped in shades of greens and whites. The walkways saw magnificent replicas of the country’s monuments. 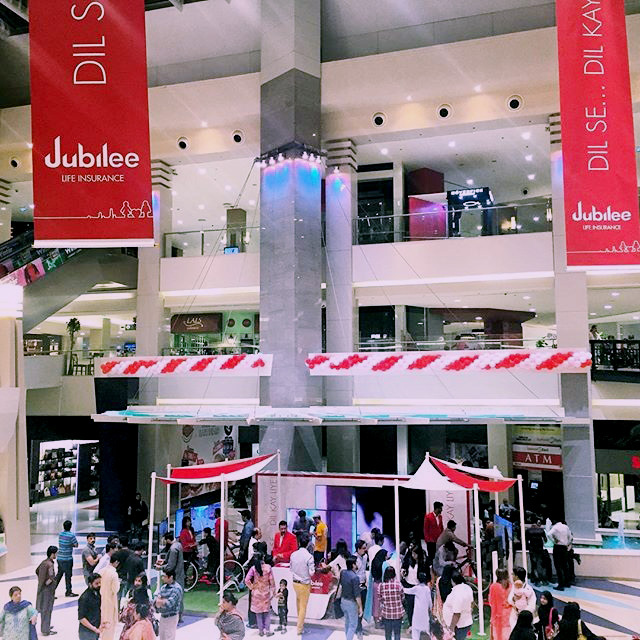 From live murals of national heroes to specially dressed guards standing and saluting the customers, the entire mall gave off 14th August vibes. The main atrium was designed to take the mall-goers on a photographic journey through Pakistan and its rich culture. Adding to the desi feel, a dhaaba was set up by Chai Wala offering fresh parathas and chai for all those craving for a cup of tea, Pakistan’s undisputed favorite drink. Folk music and a special Azadi Bazaar selling flags, badges, and other patriotic merchandise set the right mood to the three-day event. To mark the eve of Independence Day, a grandiose performance by Sounds of Kolachi dazzled the audience. The soulful music melted into the beautiful notes of our National Anthem at precisely 12 AM, midst a shower of confetti while the guards raised the flag and saluted. The moment was breathtakingly beautiful. Pakistan’s first international standard mall, Dolmen mall, is renowned for always staying a step ahead of its competitors. As summer 2016 approached its end, Dolmen hosted the city’s biggest Back to School Festival. Held from 29th to 31st July 2016 across all three Dolmen Malls, the festival aimed at school going kids and families; giving them a chance to celebrate and be excited about the beginning of another scholastic year. At Dolmen Mall Clifton, the Back to School edition of the Dolmen Bazaar saw leading retailers like Hub, Leisure Club, KidzDunya & Sindbad as well as budding entrepreneurial ventures like Magic Hands and Paperworks showcase their Back to school range. From school bags, notebooks and stationery to a delightful display of balloon art, the little ones thoroughly enjoyed themselves in this maze of amazement. Parents, on the other hand, rejoiced the rare opportunity for their kids to have fun in a safe and family-friendly environment. Adding some magic to the cauldron of excitement, Dolmen Mall conjured up the launch of Harry Potter and the Cursed Child in collaboration with Liberty Books on the third day of Back to School Festival.The launch of the 8th Harry Potter book was held on Harry Potter’s birthday, 31st July. The response was staggering; the event saw a union of three generations of Potterheads. From five year old HP fanatics flaunting painted scars on their foreheads, to tweens donned in wizard’s robes -even grownups didn’t shy away from swishing their wands and crying out ‘WingardiumLeviosa”. Fans lined up at 9:30 AM to receive their copy of the awaited book on this unique occasion where Harry Potter fandom was so majestically celebrated in Pakistan. Thematic décor, wands, hats, trivia games, giveaway for the best dressed fans and countless photo opportunities with a truly magical ambiance and music, the event was a memorable one. Dolmen Mall capitalized on the organic pull of Harry Potter fandom and took Back to School Festival to a whole new level. The event exceeded expectation on all fronts, and provided visitors with three days of festivity in a completely family-friendly environment. Dolmen aims to continue surprising its visitors with more such events in the future. Bloggers and Key Opinion Leaders were hosted by Dolmen Mall and given out special Harry Potter themed giveaways. They shared the impact the book has had on their lives and also relived their back to school memories. They were provided refreshments in the form of crispy and grilled chicken from Golden Chick and delicious cupcakes and coffee from Lals. Everyone left the vicinity of the mall happy and content, with their copy of their favorite book with them. 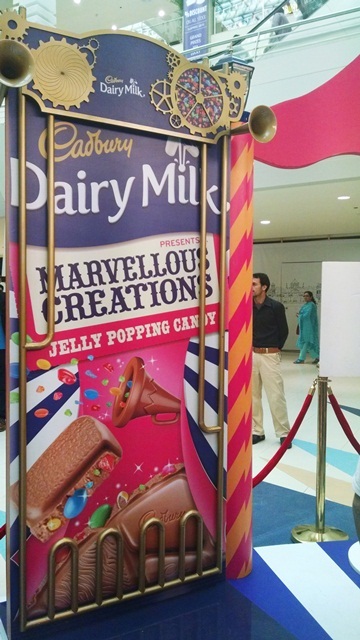 On Saturday 13th February 2016, I was invited to the launch of Cadbury Dairy Milk’s New Marvellous Creations at the Marvellous Creations Carnival at Dolmen Mall Clifton, Karachi. 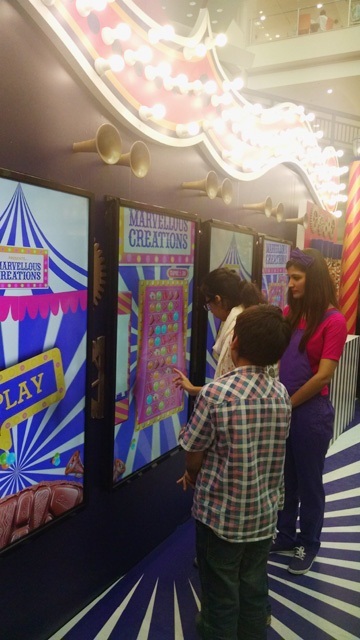 They had setup lots of interactive fun activities for all the visitors, especially for the children like Candy Crush and dart game followed by free tasting of the new exciting flavors. The wrapper designs are really cool and very eye catching. I think they look a lot more fun and quirky than regular Dairy Milk bars. Opening the wrappers I was met with the unmistakable aroma of Cadbury Dairy Milk. I couldn’t wait to tuck in! The blocks are irregularly shaped which I think this is a nice idea as it adds to the overall “fun” experience of these bars. In Jelly Popping Candy, the jelly pieces added a lovely fruity chewiness to the creamy chocolate, and the sugar coated candy added a nice bit of crunch. As you would expect, the popping candy crackles in your mouth and gives you a weird fizzy sensation. Although I love Cookie Gummy Crunch as it got sweet crunchy fruit jellies and biscuit which makes it very moreish bar. For all the chocolate lovers its a must try! Tou kiyoun na kuch meetha hojaye ?